Well, I received a phone call shortly after a local chapter election installed new officers for the Executive Committee. "We're getting rid of you," I was told by this new outings chair. Other things had been muttered at me at other times. I made some efforts to keep our Climbing-Knapsacking Section alive, and to lead more of these activities, but the Sierra Club had its way. I should have known this was coming. After being summarily expelled in 1986 from the Peak and Gorge Reorganizing Committee (letter, download in PDF format, 172Kb file), I guess that our spectacular successes and faultless safety record had done us in. There was a "Yamagata Appeal Committee" appointed to hear my case. I recited the history of the Climbing-Knapsacking Section, with the reasons for its formation, intended as an advanced peak climbing section. This held no water with the committee members. I received a final letter (download in PDF format, 215 KB file) with a second page (download in PDF format, 189 KB file) from them, which effectively scuttled my future attempts to enjoy, explore, and protect, and all, with the local chapter. I had two peaks climbs still, in the, then, present 1987 Winter/Spring schedule, so I pondered over doing them. Supported by three faithful climbers, we decided to go ahead and climb our scheduled peaks. Saturday, after a light breakfast at the soon-to-be-defunct Nut Tree along Interstate 80, we drove to Fremont, CA. We then drove to Mission Peak Regional Preserve, next to the College. We took our time hiking along dirt roads to the top. It was clear and sunny, but windy and cold. I took several photos of the view. The Bay Area is highly urbanized. The developing factories and offices of the high technology industry were starting to take over the South Bay. It had taken us roughly an hour to hike to the summit, which gladly, had no intruding structures or antennas. This area is said to be prime for hang gliders. We had lunch just off the summit, then began down. Afterwards, we had time to visit the Mission San Jose and another museum. We visited a local climber in San Jose, who guided us to dinner at a nearby seafood restaurant. Busy! We essentially camped overnight in his residence or driveway, since it is difficult to camp anywhere else in the immediate area. 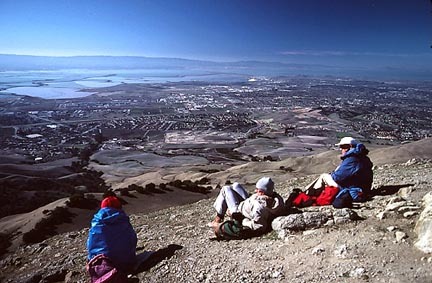 Before, however, our evening festivities, I had taken a photo of Mission Peak. Homes are being built right up to its base, as well as about it. It is probably the still available real estate elsewhere that keeps it from being developed. The next day, we followed our local climber to Uvas Canyon County Park, off U.S. 101 south. Driving on back roads toward the southwest, we came to the parking. 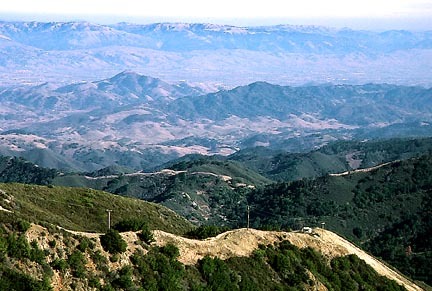 This was a starting point for Loma Prieta, the major peak in the area. It is seen rising high from many points in the Bay Area. There may have been some private land, but we weren't stopped or bothered. We hiked up on dirt roads to the summit area, where a large complex of structures were located. This is an important communications facility, under constant surveillance, with 15 foot high razor wire fences. Frustrated by our inability to touch the actual highpoint, we couldn't even make a short circumnavigation about this facility, due to more high fences. This makes one of the few developed mountaintops that I claim thusly as a peak ascent. Due to a work of man, the highpoint is, for practical purposes, untouchable. The local Sierra Club leads trips here as conditioners, and I don't know if they claim this as a peak climb, too. A similar situation exists on Mt. Lukens (5,074') which is a HPS peak in the San Gabriel Mountains north of La Canada Flintridge. This latter peak is said to be the highpoint of the City of Los Angeles. It also has the cluster of facilities, although it may be debatable whether one can touch the actual, natural, highpoint. No one came out to bother us, and we stayed a short while and enjoyed the views. I took some photos, then we hiked back down. Coming back to Uvas Canyon County Park and our cars, we drove out together to U.S. 101. We drove north on U.S. 101, after which I spent a brief time lost on freeways in San Jose.